Don Rudolph was known as an eccentric throughout his career but was often overshadowed by the fame of his burlesque-dancer wife. Known as a confident, quick-working hurler, Frederick Don Rudolph pitched everywhere from Jesup, Georgia, and Colorado Springs to Chicago and Washington during his journeyman career before his untimely death at the age of 37. Rudolph was born in Baltimore on August 16, 1931. At the age of 19, he started his professional baseball career with the Jesup Bees of the Class D Georgia State League. As a left-handed starter for the Bees, Rudolph won a total of 41 games in 1950 and 1951. After he went 28-8 in 1951, recording the most wins by a pitcher in all of Organized Baseball that season, the White Sox purchased Rudolph’s contract from the Bees for $1,000 on the recommendation of scouts Harry Postove and Herb Newberry, starting him on the path to his big-league career. As a reliever for the White Sox’ Colorado Springs affiliate in the Class A Western League, Rudolph excelled in 1952, and he finished the season with a 7-2 record. The Sky Sox’ fans appreciated his efforts so much that they held a night a night in his honor. After spending 21 months in the Army and missing the 1953 season, Rudolph returned to the Sky Sox in 1954, making 21 starts and 21 relief appearances, and finishing with a 9-14 record and a 4.33 ERA. One night in 1954, Rudolph made a fateful visit to a nightclub that soon changed his life. Performing that night was Patti Waggin, a popular burlesque dancer. Patti, whose real name was Patricia Artae Brownell, was born into a family of vaudeville performers. After dropping out from Chico State College in California, where she was known as the “Coed With the Educated Torso,” she performed burlesque numbers throughout the country. By the time she met Don, she was well-known in her field, appearing on a list of top 10 strippers in the country. Rudolph said that after sitting through three straight shows that night, it was “love at third sight.” However, when he tried to approach Patti after the last show, he was rebuffed. But Don was a persistent man and when he saw an advertisement for another performance in his hometown of Baltimore, he went to see her again. After another initial rebuff, he was able to charm Patti and buy her a soda. From there, their relationship blossomed and in 1955, they were married. In 1955, when he pitched in relief for the Memphis Chicks of the Southern Association, Rudolph’s career also began to blossom. He cut his walk rate nearly in half, though his earned run average rose to 4.77. The following year, he was given another opportunity to start regularly and stepped up to the challenge. He retained his newfound control, walking only 52 in 223 innings, and finished the year 11-10 with a 3.19 ERA, narrowly missing the league ERA title by a hundredth of a point. Patti was as supportive of Don’s career as he was of hers. An athlete herself (The Sporting News reported that she had a “collection of ten trophies won in motorcycle racing”), she often donned spikes and a catcher’s mitt to warm up her husband on the field. During games, she charted his pitches, offered advice, and cheered him on. The opposing team often had things to say about Patti and her chosen profession, but it did not seem to bother Rudolph. “At first it bothered me, but not anymore,” Rudolph told The Sporting News. “Don’t forget, it usually helps business, both at the ballpark and at Patti’s theatre. But when it gets too rough, a high, hard one under the chin usually shuts them up pretty good.” Patti, aware of the razzing, held that if her stripping hindered his career in any way, she would quit. Despite his hard work in camp and what pitching coach Ray Berres called his “rubber arm,” Rudolph spent the 1957 season in the minors. With a poor defense behind him (it was reported that no double plays were turned behind him all season), he went 8-20 with a 4.72 ERA while pitching for both Louisville and Indianapolis of the American Association. However, he kept his walk rate low and won a late-season promotion to the White Sox, making his major-league debut on September 21, 1957. In his third appearance, on September 24, Rudolph pitched six innings of relief against the Kansas City Athletics to earn his first big-league win. He also stroked his first big-league hit (a double off Tom Morgan) during the game. Overall, Rudolph made five relief appearances for the Sox in 1957 and finished with a 1-0 record and a 2.25 ERA. Rudolph showed up for spring training of 1958 with great confidence that he would stick with the Sox. In a letter accompanying his signed contract for 1958, Rudolph told owner Chuck Comiskey: “There won’t be anyone in camp who will outbattle me for a berth with the White Sox.” But despite his confidence, Rudolph was again sent to Indianapolis for more seasoning. With a better defense behind him, his line improved to 11-12 with a 3.05 ERA, earning him another late-season call-up with the White Sox. Used exclusively as a reliever, Rudolph pitched in seven games, finished six of them, and ended the year with a record of 1-0 and an ERA of 2.57. Rudolph bounced between the majors and minors for the rest of 1959 with stints with the Cincinnati Redlegs, the Seattle Rainiers of the Pacific Coast League, and the Havana Sugar Kings of the International League. Although he struggled with the Redlegs and the Sugar Kings, he performed well as a starter for Seattle, finishing 7-4 with a 3.08 ERA in 13 games. Although Rudolph missed out on most of the White Sox’ pennant season, his teammates voted him a one-quarter share of the World Series money. Rudolph did not reach the majors in 1960, but continued to pitch well for the Seattle Rainiers as a starter, leading the PCL with a 2.42 ERA. He moved to Indianapolis for the start of 1961, a year that turned out to be important for him personally as well as professionally. That year, Patti and Don welcomed their daughter, Julena, into the world. While Patti took time off from her burlesque career to raise their daughter, Don won the American Association’s Player of the Month award for August, was a member of the Triple-A All-Star team, and finished with an 18-9 record and a 3.54 ERA. Rudolph wanted to get another shot in the majors and he got his chance the following year, when the Cleveland Indians picked him up in the Rule 5 draft after the 1961 season. He broke camp with Cleveland after 1962 spring training but pitched only one game before being traded to the expansion Washington Senators with pitcher Steve Hamilton for outfielder Willie Tasby on May 3. The Senators gave Rudolph what he wanted most – a spot in the starting rotation. He took full advantage of the opportunity. On May 9, he won his first start with a complete-game victory over his former team, the White Sox. He pitched 31 consecutive scoreless innings between August 18 and September 2, and even made the American League All-Star Team – as a batting-practice pitcher. Even after an ugly September (0-4 with an 8.27 ERA), he was able to finish the year with an 8-10 record and a 3.62 ERA. Rudolph was widely known as the “instant pitcher” – one of the quickest workers in the league. Seven of his 23 starts in 1962 were completed in less than two hours, including one against the Angels in only one hour and 32 minutes – the fastest game that year. His low walk rate and the low number of warm-up pitches he took between innings (he often took just three of the allotted eight) contributed to his quick work. Rudolph is credited with inspiring the “hurry up” rule enacted in 1963 that cut the number of warm-up pitches allowed between innings to five. Late in the 1962 season, Rudolph was a participant in a bizarre incident at Memorial Stadium in Baltimore. After troubled Senators outfielder Jimmy Piersall received what Rudolph called “the most vicious tongue lashing I’ve ever encountered” from a fan, Piersall jumped into the stands to confront his heckler. Rudolph, who was standing near Piersall during the incident, jumped into the stands to give chase to Piersall. A police officer was able to confront Piersall before he reached the man and Rudolph sat on him to subdue him. Fresh off his previous year’s success, Rudolph was the first Senator to sign his contract for 1963. Don also had some bold predictions to make: He would be the Opening Day starter for the Senators, and would win 20 games. He was in fact the Opening Day starter for the Senators. But in front of President John F. Kennedy (his final Opening Day), the Orioles bested Rudolph, 3-1, behind home runs by Jim Gentile and Boog Powell. It didn’t get much better for Rudolph after that. After his seventh win on August 4, he went 0-8 with a 6.93 ERA to finish 7-19 with a 4.55 ERA as the Senators lost 106 games and finished last in the AL. In 1964, Rudolph had no bold predictions. 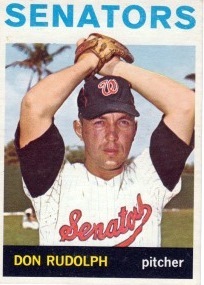 While he had a 1.38 ERA in spring training, Don was sent to the Senators’ minor-league club in Toronto the day before the season started. After pitching well in Toronto (3-1 with a 1.40 ERA in 45 innings pitched), Rudolph was recalled by the Senators on May 21, but he could not capture the magic of 1962. Used primarily as a reliever and spot starter, Rudolph finished with a 1-3 record and a 4.09 ERA. Rudolph was unhappy with his treatment by the Senators in 1964, claiming he was “misused.” He was also upset at being sent to the minors to clear the way for “bonus babies” and promised that he would be “blooming when these morning glories fade.” Despite this promise, Rudolph’s major-league career was over. The 1965 and 1966 seasons were spent in the minors with San Diego and Buffalo, where he went 20-28 with a 3.26 ERA. Rudolph retired from professional baseball after the 1966 season at the age of 35. Throughout his career, Don had many plans for life after baseball. He once said he wanted to open a club for his wife named Don Rudolph’s Patti Waggin. Later he said he wanted to be an avocado farmer. But Rudolph ended up starting a contracting business called Underground Utility Company. Tragically, he did not have much time to enjoy his post-baseball life. On September 12, 1968, as Rudolph drove his truck up a steep grade near his home in Granada Hills, California, the truck overturned and he was thrown from the vehicle. The truck rolled over and crushed him. Don Rudolph was dead at the age of 37. The 1959 series of Topps baseball cards, Don’s first, had little cartoons on the back to tell something about the player pictured on the front. Rudolph’s (#179) reads: “Don’s wife is a professional dancer.” But even though he was often overshadowed by his wife, Don Rudolph left his mark on the game through his eccentricities and his quick work on the mound. This article originally appeared in the book Go-Go To Glory--The 1959 Chicago White Sox (ACTA, 2009), edited by Don Zminda.